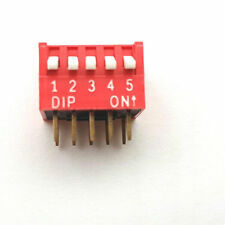 Product Group DIP Switch. Type Std Piano. Positions 05 Pos. Lead Space Raster 2.54. 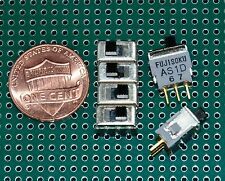 STANDARD 0.300" SPACING X 0.100" PITCH MAY BE SOLDERED TO BOARD OR PLUGGED INTO DIP SOCKET. The pitch of the PCB pins is 5mm. 6 pins, On-ON DPDT. 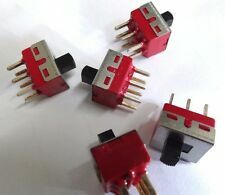 Soldering pin type, 1.5A 250VAC, 3A 125VAC. Net weight approx : 52g, 10pc. 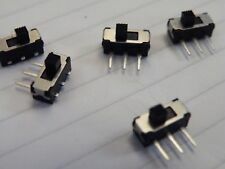 Suitable for Fisher Amplifier : SS22K29 ,black, H=10mm. Slide Switch. Switch bar height : 10.0mm. Mounting screw pitch : 28.0mm. Pin Pitch: 2.54mm. 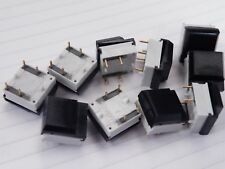 10 Pcs x Slide Switch. Also a great component for DIY. Insulation Resistance: 100mΩ Min at 500V DC. Knob Travel Distance: 2.0mm. Due to the different monitor and light effect, the actual color of the item might be slightly different from the color showed on the pictures. With UL,CSA, VDE. 9 safety. 6 pins, DPDT. Net weight approx : 30g, 5pc. Soldering pin type, 10A 125/250VAC. Mounting screw pitch : 34.2mm. Slide Switch. Switch panel : 42.0x14.5mm, LxW. Screw hole : M3x0.5. Specification : On-Off 6P, DPDT, 0.5A 50VDC/AC, PCB mount type. SK-22F02 G10. Bar X= 10mm. 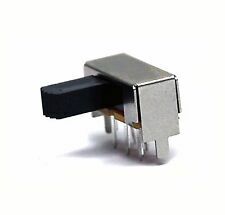 switch pin / pitch :1.0x0.3x6.0mm, WxTxL / 4x4x2.5mm. Fix soldering pin / pitch :2.0x0.4x2.8mm, WxTxL / 16.5mm. 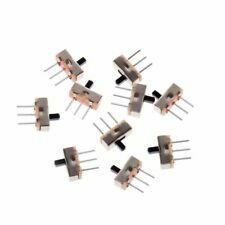 (20Pcs 6mm 0.5A 50VAC High Side Knob 6 Pin 2 Position DPDT Slide Switch SK22H03. Manufacture Part Number: SK22H03. Knob height: 6mm. 2) Side knob Handle, height is 6 mm. 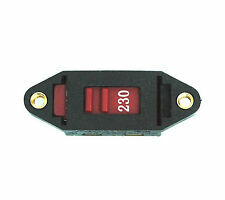 Rated Load: DC 0.1A 120V. Insulation Resistance: greater than 0.1 ohm. This switch has 2 positions Dielectric Strength: 500V AC. ON on one side &. Net weight approx : 510g, 100pc. 6 pins, On-ON DPDT. 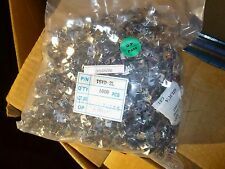 Soldering pin type, 1.5A 250VAC, 3A 125VAC. Suitable for Fisher Amplifier : X-100 / X-101 / X-101-C / X-200 / X-202 / X-202-B / 400 / 400C / 500 / 500C. etc. Soldering pin type, 1.5A 250VAC, 3A 125VAC. Net weight approx : 600g, 100pc. 6 pins, On-ON DPDT. Slide Switch. Switch bar height : 5.8mm. Mounting screw pitch : 28.0mm. Screw hole : M3x0.5. Switch panel : 35x12.7mm, LxW. 4P2T with total 12 pins connection. 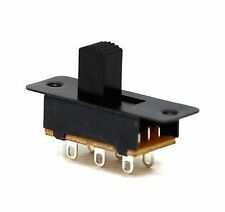 1pc 4P2T Mini Slide Switch. Rated Power: 0.3A 50V DC. PCB Mount. 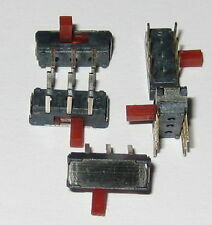 Suitable for all Small signal circuits Switching. 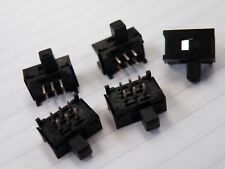 Switch size: L14.4 x W6 x H5.5mm. 1x TYCO ASE42G , SWITCH SLIDE 4PDT EXTD SLIDE 0.3A 115VDC PC PINS T.H. 1 UNIT TYCO ASE42G . 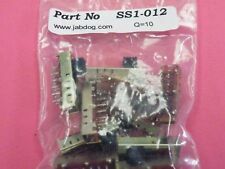 SWIT SLIDE 4PDT EXTD SLIDE 0.3A 115VDC PC PINS T.H. NEW PART, OLD D/C.